This work is supported by Anaconda Inc. and the Data Driven Discovery Initiative from the Moore Foundation. Anaconda is interested in scaling the scientific python ecosystem. My current focus is on out-of-core, parallel, and distributed machine learning. This series of posts will introduce those concepts, explore what we have available today, and track the community's efforts to push the boundaries. You can download a Jupyter notebook demonstrating the analysis here. I'm constrained by size: My training dataset fits in RAM, but I have to predict for a much larger dataset. Or, my training dataset doesn't even fit in RAM. I'd like to scale out by adopting algorithms that work in batches locally, or on a distributed cluster. I'm constrained by time: I'd like to fit more models (think hyper-parameter optimization or ensemble learning) on my dataset in a given amount of time. I'd like to scale out by fitting more models in parallel, either on my laptop by using more cores, or on a cluster. These aren't mutually exclusive or exhaustive, but they should serve as a nice framework for our discussion. I'll be showing where the usual pandas + scikit-learn for in-memory analytics workflow breaks down, and offer some solutions for scaling out to larger problems. This post will focus on cases where your training dataset fits in memory, but you must predict on a dataset that's larger than memory. Later posts will explore into parallel, out-of-core, and distributed training of machine learning models. and fit your model on a (representative) subset of your data. You may not need distributed machine learning. The tricky thing is selecting how large your sample should be. The "correct" value depends on the complexity of your learning task, the complexity of your model, and the nature of your data. The best you can do here is think carefully about your problem and to plot the learning curve. As usual, the scikit-learn developers do a great job explaining the concept in addition to providing a great library. I encourage you to follow that link. This gist is that—for some models on some datasets—training the model on more observations doesn't improve performance. At some point the learning curve levels off and you're just wasting time and money training on those extra observations. For today, we'll assume that we're on the flat part of the learning curve. Later in the series we'll explore cases where we run out of RAM before the learning curve levels off. In my experience, the first place I bump into RAM constraints is when my training dataset fits in memory, but I have to make predictions for a dataset that's orders of magnitude larger. In these cases, I fit my model like normal, and do my predictions out-of-core (without reading the full dataset into memory at once). We'll see that the training side is completely normal (since everything fits in RAM). We'll see that dask let's us write normal-looking pandas and NumPy code, so we don't have to worry about writing the batching code ourself. To make this concrete, we'll use the (tried and true) New York City taxi dataset. The goal will be to predict if the passenger leaves a tip. We'll train the model on a single month's worth of data (which fits in my laptop's RAM), and predict on the full dataset2. The first time you're introduced to scikit-learn, you'll typically be shown how you pass two NumPy arrays X and y straight into an estimator's .fit method. We set up each step, and manually pass the data through: X -> X_filled -> X_scaled. The downside of this approach is that we now have to remember which pre-processing steps we did, and in what order. The pipeline from raw data to fit model is spread across multiple python objects. A better approach is to use scikit-learn's Pipeline object. Each step in the pipeline implements the fit, transform, and fit_transform methods. Scikit-learn takes care of shepherding the data through the various transforms, and finally to the estimator at the end. Pipelines have many benefits but the main one for our purpose today is that it packages our entire task into a single python object. Later on, our predict step will be a single function call, which makes scaling out to the entire dataset extremely convenient. If you want more information on Pipelines, check out the scikit-learn docs, this blog post, and my talk from PyData Chicago 2016. We'll be implementing some custom ones, which is not the point of this post. Don't get lost in the weeds here, I only include this section for completeness. This isn't a perfectly clean dataset, which is nice because it gives us a chance to demonstrate some pandas' pre-processing prowess, before we hand the data of to scikit-learn to fit the model. We'll reconcile that by lower-casing everything with a .str.lower(). But resist the temptation to just do that imperatively inplace! We'll package it up into a function that will later be wrapped up in a FunctionTransformer. I should note here that I'm using .assign to update the variables since it implicitly copies the data. We don't want to be modifying the caller's data without their consent. "Transform each datetime in `columns` to integer hour of the day"
Likewise, we'll need to ensure the categorical variables (in a statistical sense) are categorical dtype (in a pandas sense). We want categoricals so that we can call get_dummies later on without worrying about missing or extra categories in a subset of the data throwing off our linear algebra (See my talk for more details). Convert to Categorical with specific `categories`. Finally, we'd like to normalize the quantitative subset of the data. Scikit-learn has a StandardScaler, which we'll mimic here, to just operate on a subset of the columns. "Scale a subset of the columns in a DataFrame"
Side-note: I'd like to repeat my desire for a library of Transformers that work well on NumPy arrays, dask arrays, pandas DataFrames and dask dataframes. I think that'd be a popular library. Essentially everything we've written could go in there and be imported. It turns out people essentially tip if and only if they're paying with a card, so this isn't a particularly difficult task. Or perhaps more accurately, tips are only recorded when someone pays with a card. OK, so we've fit our model and it's been basically normal. Maybe we've been overly-dogmatic about doing everything in a pipeline, but that's just good model hygiene anyway. Now, to scale out to the rest of the dataset. We'll predict the probability of tipping for every cab ride in the dataset (bearing in mind that the full dataset doesn't fit in my laptop's RAM, so we'll do it out-of-core). To make things a bit easier we'll use dask, though it isn't strictly necessary for this section. It saves us from writing a for loop (big whoop). Later on well see that we can, reuse this code when we go to scale out to a cluster (that part is pretty cool, actually). Dask can scale down to a single laptop, and up to thousands of cores. X is a dask.dataframe, which can be mostly be treated like a pandas dataframe (internally, operations are done on many smaller dataframes). X has about 170M rows (compared with the 14M for the training dataset). Since scikit-learn isn't dask-aware, we can't simply call pipe.predict_proba(X). At some point, our dask.dataframe would be cast to a numpy.ndarray, and our memory would blow up. Fortunately, dask has some nice little escape hatches for dealing with functions that know how to operate on NumPy arrays, but not dask objects. In this case, we'll use map_partitions. map_partitions will go through each partition in your dataframe (one per file), calling the function on each partition. Dask worries about stitching together the result (though we provide a hint with the meta keyword, to say that it's a Series with name yhat and dtype f8). Now we can write it out to disk (using parquet rather than CSV, because CSVs are evil). This takes about 9 minutes to finish on my laptop. If 9 minutes is too long, and you happen to have a cluster sitting around, you can repurpose that dask code to run on the distributed scheduler. I'll use dask-kubernetes, to start up a cluster on Google Cloud Platform, but you could also use dask-ec2 for AWS, or dask-drmaa or dask-yarn if already have access to a cluster from your business or institution. This sets up a cluster with 8 workers and 54 GB of memory. The next part of this post is a bit fuzzy, since your teams will probably have different procedures and infrastructure around persisting models. At my old job, I wrote a small utility for serializing a scikit-learn model along with some metadata about what it was trained on, before dumping it in S3. If you want to be fancy, you should watch this talk by Rob Story on how Stripe handles these things (it's a bit more sophisticated than my "dump it on S3" script). For this blog post, "shipping it to prod" consists of a joblib.dump(pipe, "taxi-model.pkl") on our laptop, and copying it to somewhere the cluster can load the file. Then on the cluster, we'll load it up, and create a Client to communicate with our cluster's workers. The loading took about 4 minutes on the cluster, the predict about 10 seconds, and the writing about 1 minute. Not bad overall. 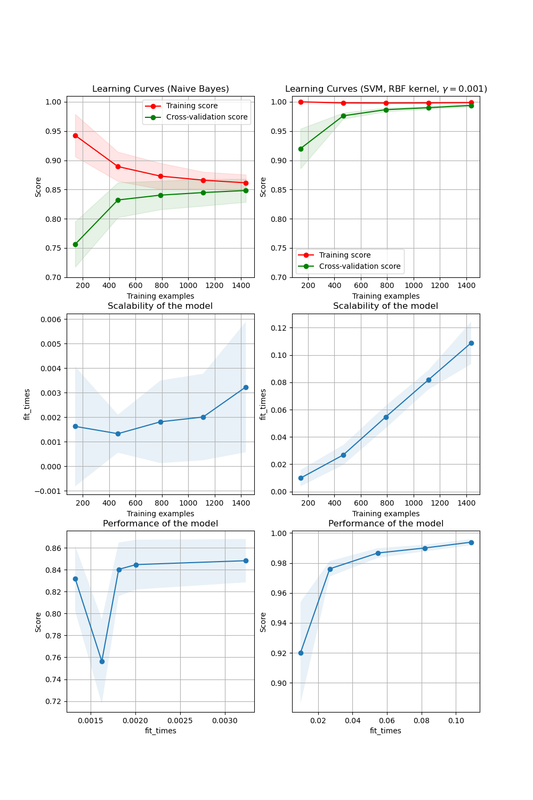 Today, we went into detail on what's potentially the first scaling problem you'll hit with scikit-learn: you can train your dataset in-memory (on a laptop, or a large workstation), but you have to predict on a much larger dataset. We saw that the existing tools handle this case quite well. For training, we followed best-practices and did everything inside a Pipeline object. For predicting, we used dask to write regular pandas code that worked out-of-core on my laptop or on a distributed cluster. If this topic interests you, you should watch this talk by Stephen Hoover on how Civis is scaling scikit-learn. Until then I would really appreciate your feedback. My personal experience using scikit-learn and pandas can't cover the diversity of use-cases they're being thrown into. You can reach me on Twitter @TomAugspurger or by email at tom.w.augspurger@gmail.com. Thanks for reading! © Tom Augspurger. Powered by Pelican, Theme is using HSS.